My father, who encountered Dr Patterson on his trips to Scotland seeking information (and probably lineside permits) called him a charming Ulsterman. He was the author of several excellent railway histories covering the Northern part of Ireland. David & Charles made an excellent job of his publications.. The Ballycastle Railway a history of the narrow-gauge railways of North east Ireland. Part I. Dawlish (Devon), David & Charles, 1965. 154 p. + col. front. & 20 plates. 41 illus., 6 diagrs., 19 tables, 8 maps, map. Bibliog. The Ballymena lines : a history of the narrow gauge railways of North East Ireland. Part 2. Newton Abbot (Devon), David & Charles, 1968. 200 p. + col. front. + 16 plates. 40 illus. (incl. 4 ports. ), 10 diagrs., 32 tables, 21 plans, 4 maps. Bibliog. The Clogher Valley Railway. Newton Abbot: David & Charles, 1972. 271pp. including plates. + col. front. Describes a line, which was essentially a roadside tramway, which ran right down the street in Fivemiletown. The author's roots lay in the area described and this shows in its accounts of the people and their activities. It must have been a wonderful line in its relatively brief high days when Orangemen were crammed into the same trucks which pigs had used a few days before on their trips to the fair: Patterson is convinced that the improvement over walking was worth the slight discomfort to meet friends last seen a year before. At that time people were willing to start out at 4 in the morning and be satisfied with returns after sunset to get to cattle fairs involving changes onto the GNR main line either at Tynan or at Maguire's Bridge. He was fulsome in his acknowledgements, including to many who had travelled on the line, and to R.N. Clements for his assistance on the section on the locomotive stock. 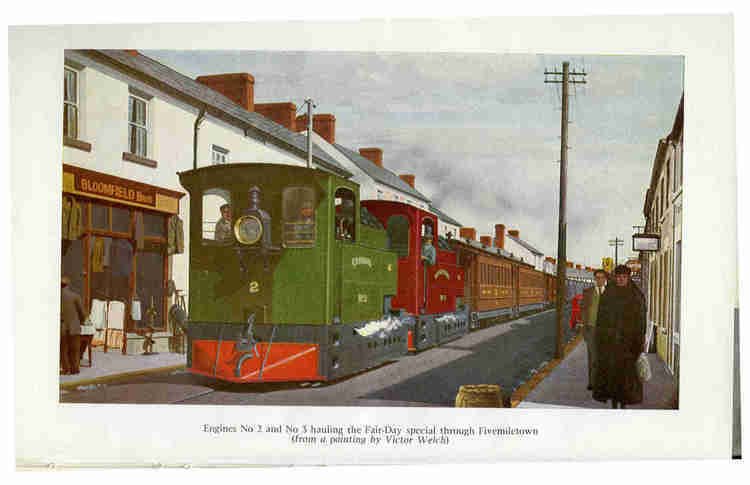 The County Donegal Railways : a history of the narrow gauge railways of North-West Ireland. Part 1. Dawlish (Devon), David & Charles, 1962. 157 p. + col. front. + 17 plates (incl. 1 folding). 50 illus., 11 diagrs. (incl. 6 s. els. ), 5 tables, 8 plans, 2 maps. Bibliog. The Great Northern Railway of Ireland. Lingfield (Surrey), Oakwood Press, 1962. [iv], 188 p. + front. + 20 plates. 51 illus., 2 diagrs., 16 tables. plan, 8 maps. Bibliog. Locomotive development is not considered in depth, but the appendixes include tabulated data on the locomotive stock.